Let's start the ball rolling with a big 'WELL DONE!!!' 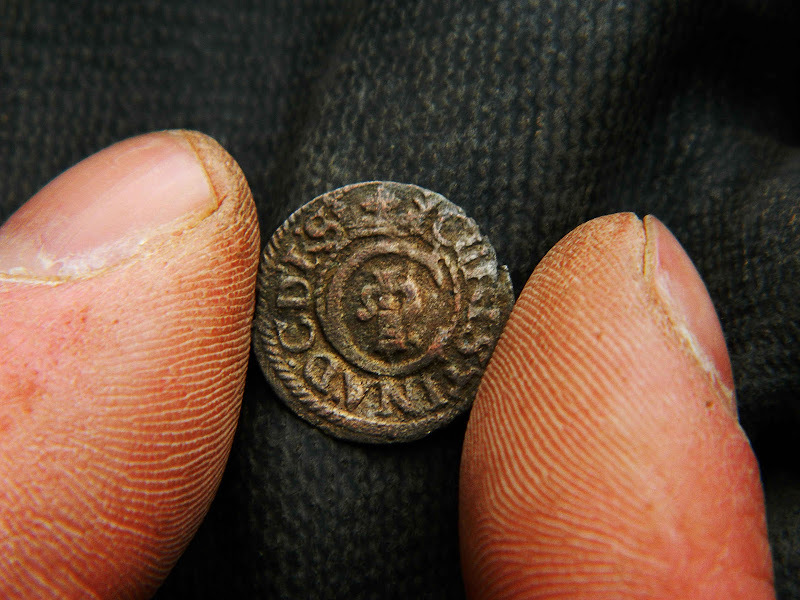 to Paddy for this little beauty of a Latvian/Swedish CHRISTINA RIGA SOLIDUS SILVER COIN 1632-1654 (Schilling). An absolute gem. Rare to see toning on silver hammered like this. 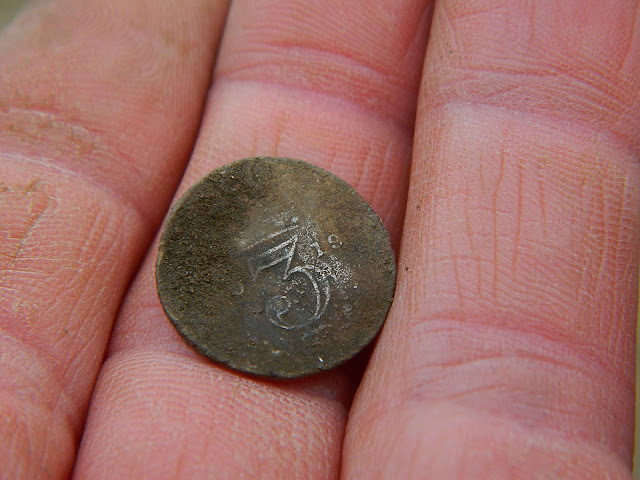 A massive thank you to Coinage Britannia (You Tube) for ID'ing this like it was a penny in his pocket! 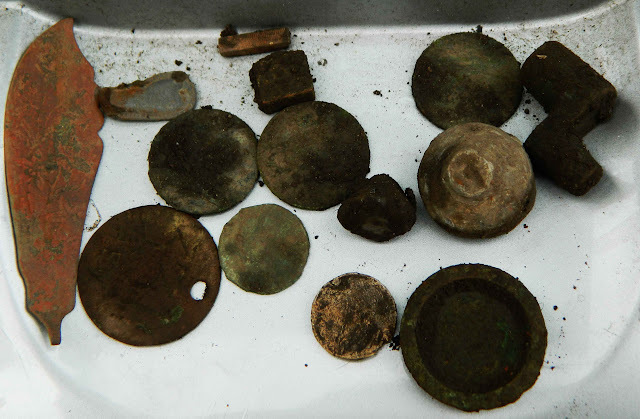 More pics to come when I clean my own finds up but I took some coppers and silver home with me. 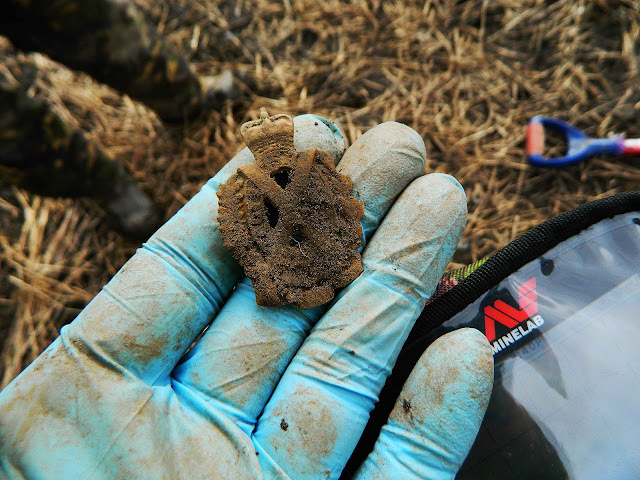 A nice Cap badge rounded off a lot of decent finds from a great dig! 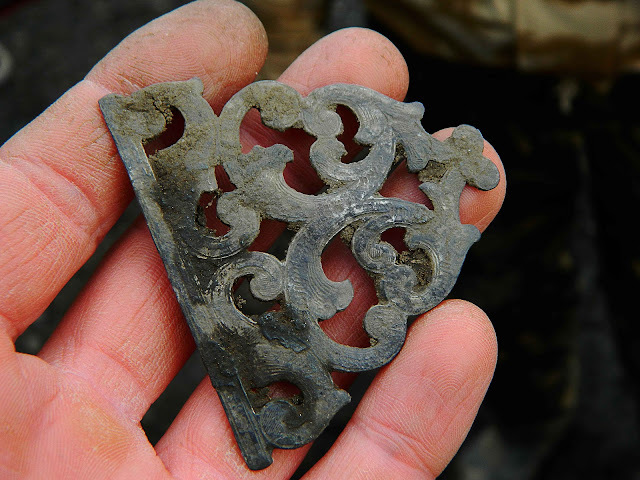 I'm currently picture finishing, if you've got any to add of your finds today, please do! If I don't credit the finder in my shots, I'll ask who it was. If someone knows please let me know so I can update the finder credits! Cheers. 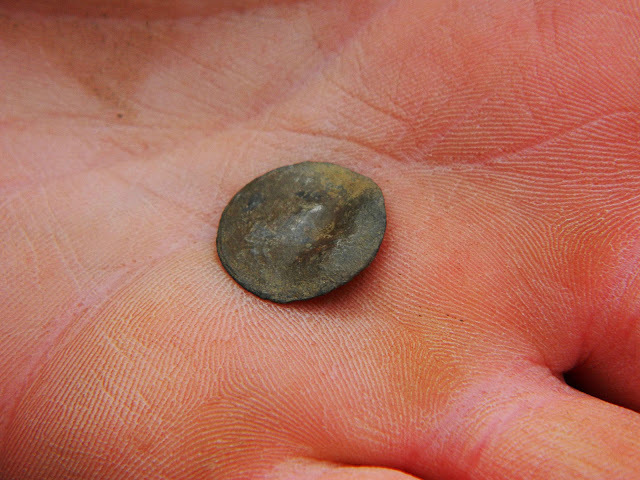 It is a lovely wee coin, on a note about my day I have never dug so much in a day it was great. I think I had more coppers today than I have collected since starting detecting but I think my find of the day was my half military badge. 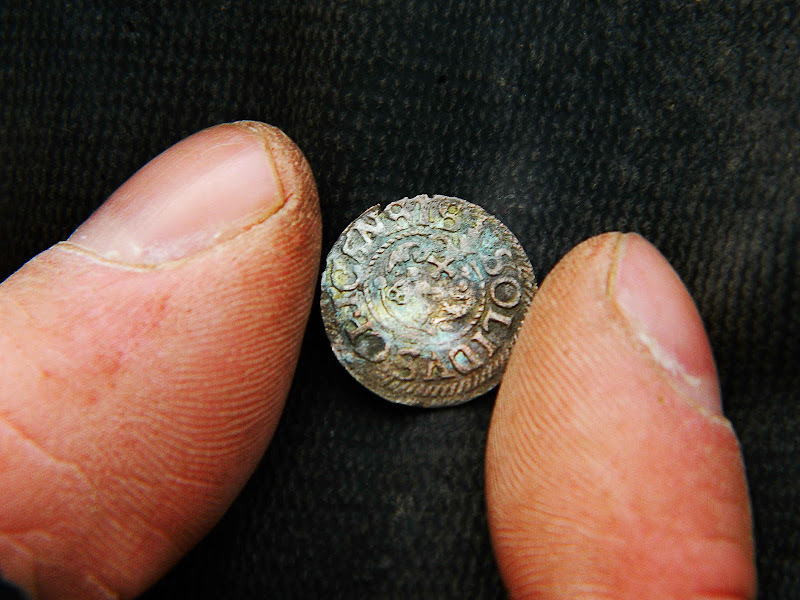 Oh and well done paddy on the find of the coin and showing me it on the field I just could believe it was that small lol a very good first ever find too. 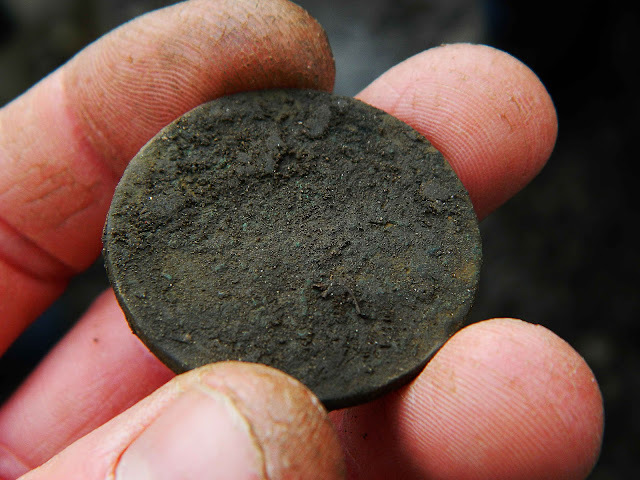 It is a lovely wee coin, on a note about my day I have never dug so much in a day it was great.. Agreed. 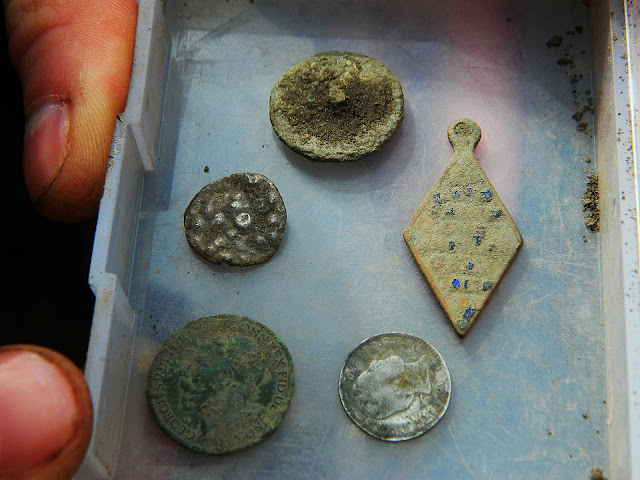 Great dig and so many targets! 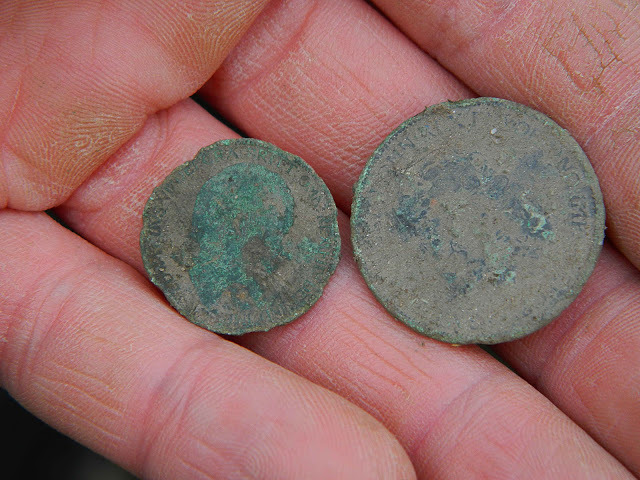 Nice finds Paul! The tin just after the hammered is mine. 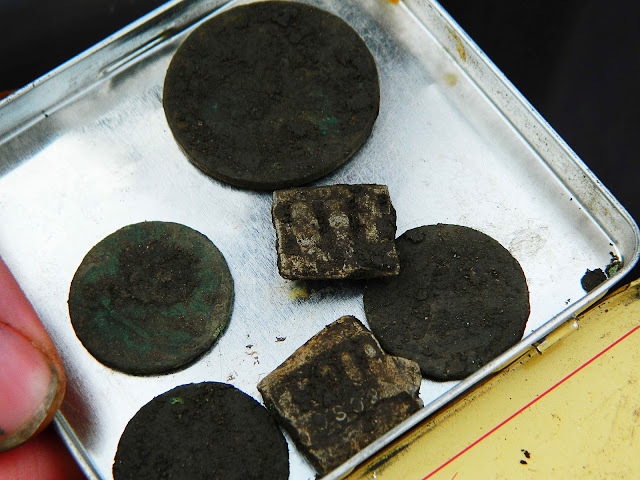 Am too bloody tired to photograph stuff so will add in next few days- that was a helluva lot of digging! 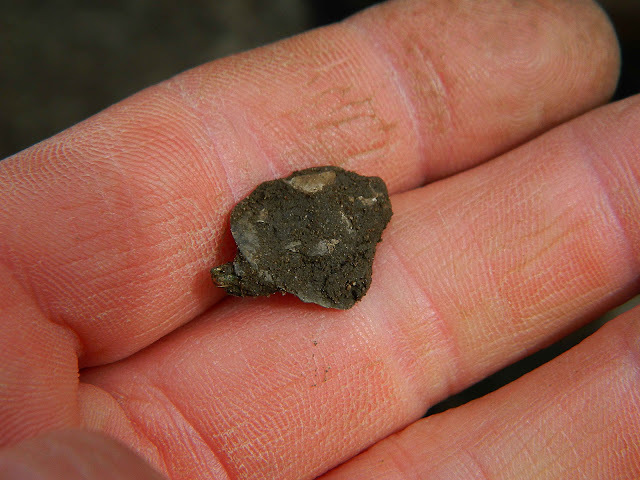 Also found an intact wee lead soldier crouching down with rifle- British Army and is wearing a kilt . heheh. If at first you don't succeed... deny you were ever trying! Lead: You need your roof done? Nice to get the Cartwheel! Good to meet you, briefly albeit! 1900 Scottish horse regiment Cap badge. 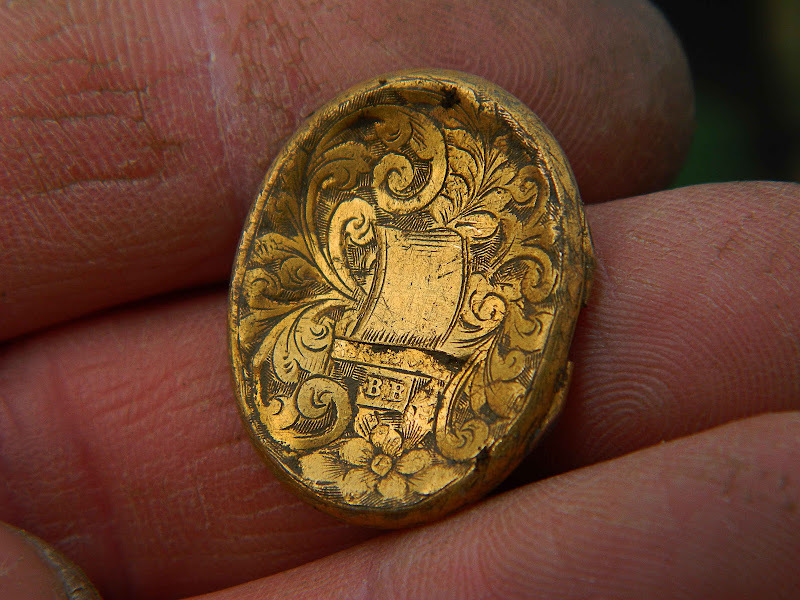 Gilded button with plenty of gilt left. Silver heart with thistle in the middle. 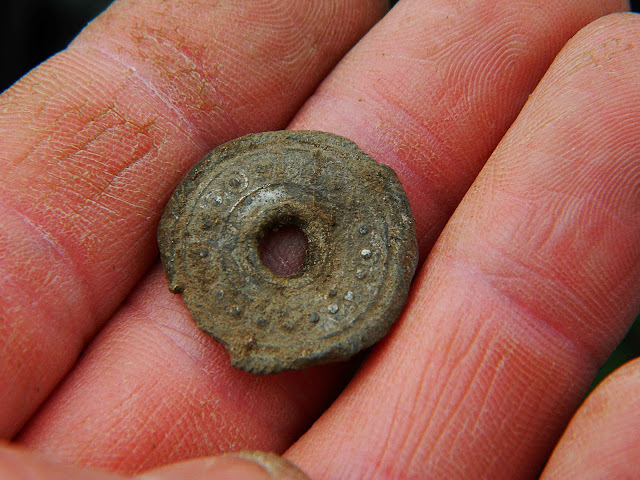 Naval button with small amount of gilding still visible. Lead buttons and dress weights. 4 vintage bottle tops . 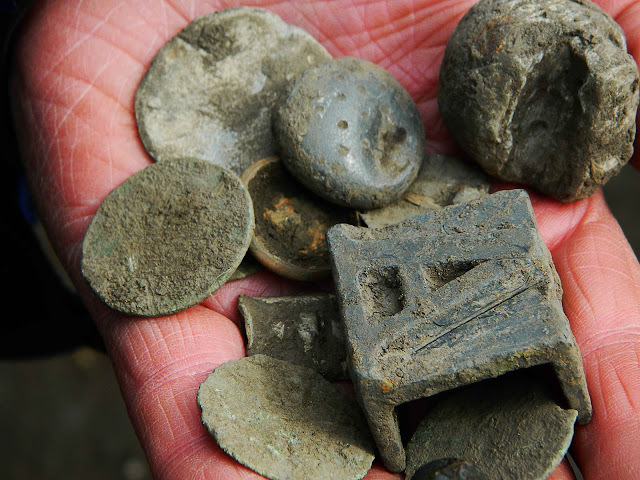 Hand full of buttons too far gone to tell what they depict. Nice small piece of decorative marble. 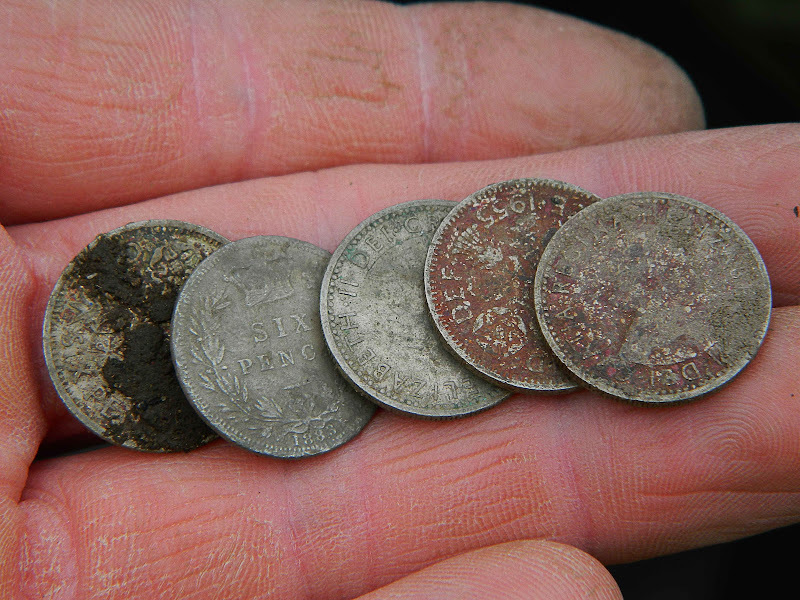 1919 3d is mines, I got heaps of stuff at todays dig these include..
That's some list James! Was good to catch you on the fields today. 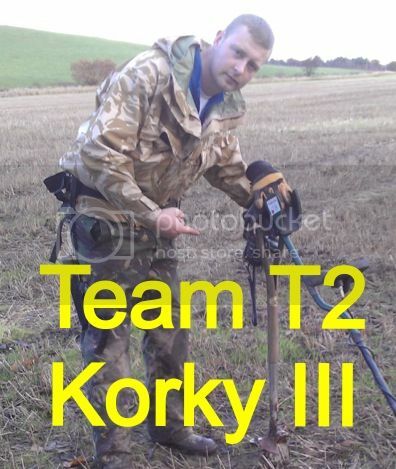 We made some team photographing that wee hammered! 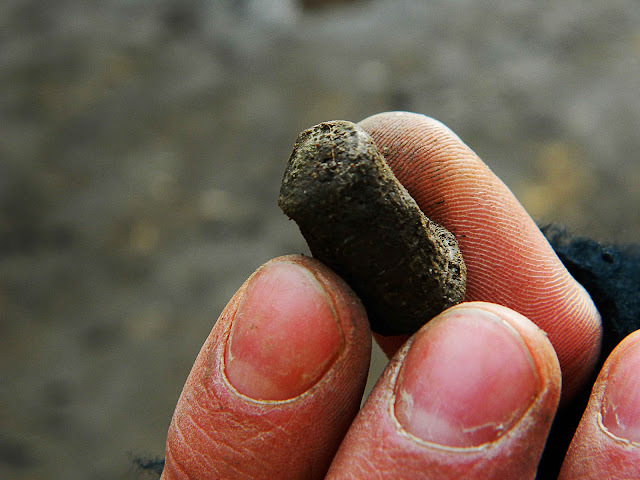 Many thanks for making me welcome at the dig, for my first organised dig I was very happy, I thought it was a trade token so I am very happy to find out it is a silver hammered. 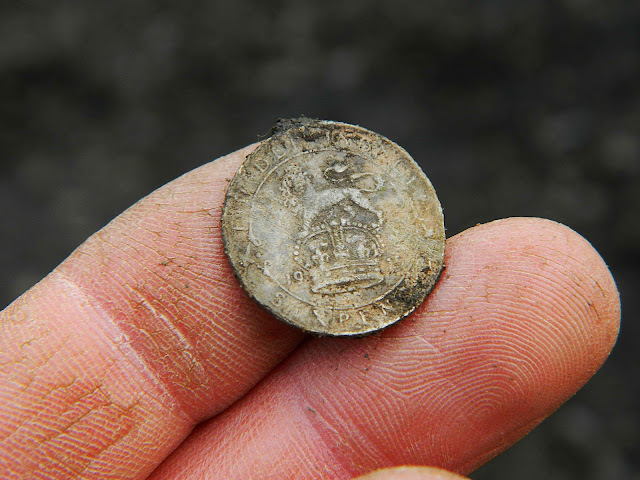 I also retrieved a bale seal, a 1915 silver sixpence and some unidentified coins, and lots of lead. 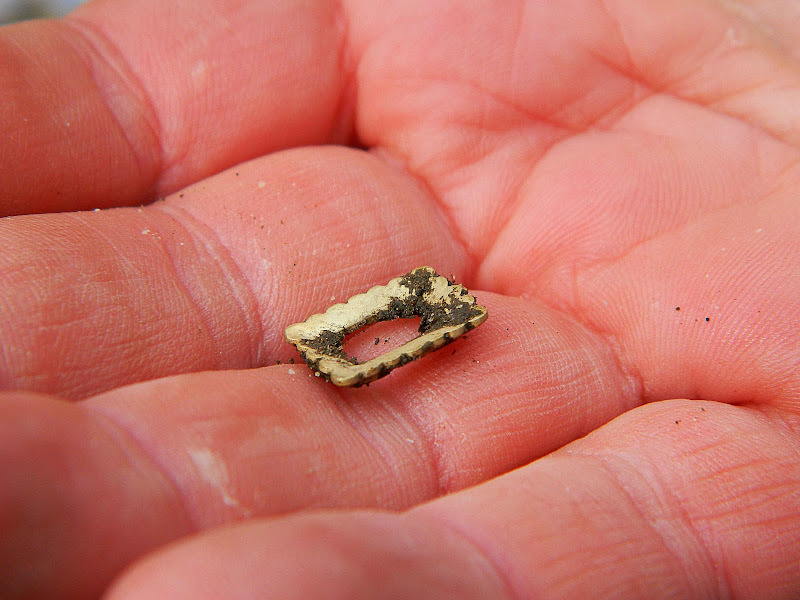 Cheers for the ID and I am surprised its that old, it was small and is very thin.